The temperatures have finally normalized in Southern California, reaching 80 degrees the last two days. Now before you move on to another blog in disgust, that’s not what this is about, so please bear with me. It did help when the train was stuck for somewhere between 2 1/2 and 3 hours. We were able to get off and sit on the platform or just hang out on the train with the doors open. 80 degrees in January is not the same as the summer so it wasn’t hot, it was rather pleasant. I luckily had a book and an iPhone with a full charge to listen to music instead of all the complaining. And of course, the biggest bond is the snow. 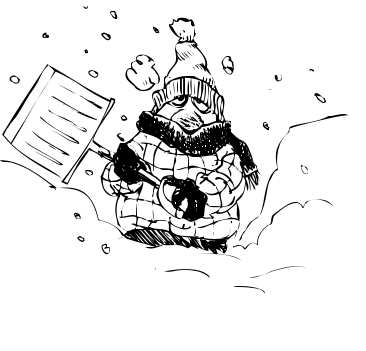 Everyone becomes friendly neighbors when you get hit by a big snow, which doesn’t melt and then you get hit by a big snow again. Helping to dig someone out, throwing your coat on and braving the cold because someone’s trying to get down the street and their tires are spinning and not moving and of course, respecting the shoveled parking space marked by two folding chairs. People help each other more under these extreme circumstances without even needing a thank you. That can wait until the summer block party when you love everyone after 8 beers. There’s not really an equivalent in Los Angeles. But while everyone was complaining about not being able to get anywhere, stuck at the same station, I was grateful for the beautiful weather and that I chose the 32GB iPhone over the 16GB.